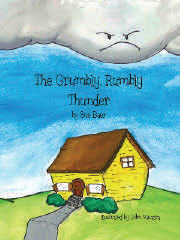 CIPA member and author Sue Baer’s second full‐color, hardbound children’s book, The Grumbly, Rumbly Thunder, is now available in independent book stores and online at www.suebaer.com. Grumbly is a fun story about a little girl and her Gramma, who teaches her not to fear thunder, but to hear it as a friendly warning to get inside in a hurry! Little kids enjoy the illustrations, and it is suitable for children through first grade (or older) as a good read and a helpful lesson.